What do you do with a massively profitable trade that has grown to become a large percentage of your total portfolio value? This question has been circulating in the Macro Ops Collective chat room the last few weeks because one of our deep out of the money (DOTM) calls took off in a big way. Back in the summer we bought call options on AMD struck at 28 for $0.40. 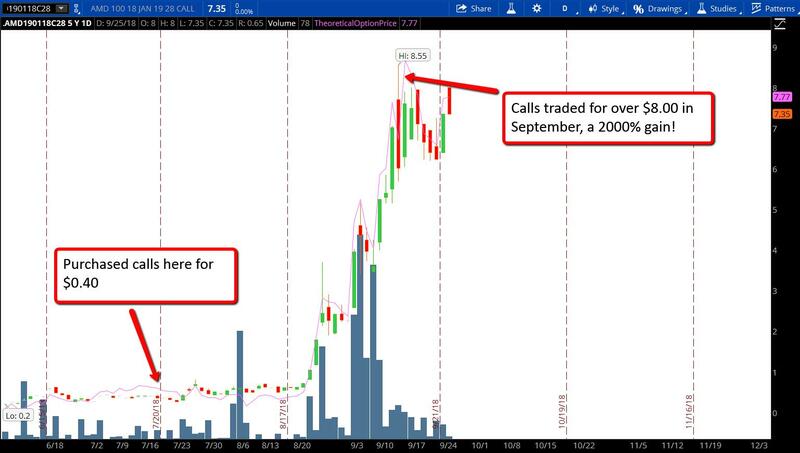 Those calls traded as high as $8.50 in the month of September — a 2000% gain. Managing large winners like this is difficult… really difficult. The reason being is that there’s no universally correct answer. Managing losing trades is pretty straight forward. You define the risk before you enter and once the asset hits your stop, you exit. Easy peasy. Winners are a whole other animal. Now you’re faced with the question of: Do I let my winner keep running and risk giving some or all of my profits back or do I take profits now foregoing more upside but putting cash in hand? This is literally one of the toughest questions in trading and something we at MO are constantly stewing on. A winning DOTM option magnifies this conflict because of how volatile they become once they go in the money. A DOTM option can easily lose 30-50% of its value in a day if the stock pulls back after an extended run. Another difficulty with a profitable DOTM option is that as it becomes more in the money, the reward-to-risk payout structure shifts from a highly convex one to being more linear. When a stock crosses the strike of a DOTM call the options have usually already appreciated by 10x-20x. At this point, the forward reward-to-risk drastically changes. Instead of risking 1 unit to make 10 or 20, you’re now risking 10-20 units of unrealized profit for a potential gain of another 10-20. So instead of a 10:1 reward-to-risk in your favor, it becomes a 1:1 proposition. After mulling this over for awhile with the other members of the Macro Ops Collective we think the profit taking decision comes down to these two things. You may think a DOTM call option will go on to appreciate from a 20 to a 40 bagger. But, what’s really important is whether you have the psychological makeup that will allow you to actually hold through the inevitable volatility and realize that second tranche of gains. Your ability to hold through the volatility without tapping out is dependent on the size of the position relative to your net worth. This is also why managing large winners is so difficult. Since everyone has their own unique risk tolerances, there’s no “one size fits all” advice. Scenario 1: Bob puts $10,000 in a DOTM call that turns into $200,000. He has a net worth of $500,000. Which of these two traders will have an easier time pressing and holding their winner? Obviously, Jane will, because Bob’s going to feel it right in the gut if he gives back half those gains (20% of his net worth) to the market. It will bother Jane too, but will be much less mentally trying. The larger the position is relative to your net worth the more mentally taxing it is to hold onto. It’s painful to watch large paper gains swing up and down by double digit amounts on a weekly basis — which is exactly what can happen if you hold onto a DOTM call option that has 20x’d but still has many months until expiration. Only a small fraction of traders have the stomach for holding onto large winners like these that have become a large percentage of their total portfolio values. Operator Darrin pointed this out during our conversations in the Comm Center. He correctly states that this ability is partially hereditary. At the point in which the trade started to yield some strong profits, he held on. We are talking .03 delta —>.50 delta kind of profits. Yet, he continued to hold on. The moral of the story is that 95% of humans do not have the ability to actually execute at this level. I meet so many smart quantitative analysts and traders, yet I know that almost none of them have the behavioral edge necessary to reap the benefits of triple digits even four digit returns—and that’s perfectly ok! I say all of this to remind retail traders that it’s ok to be average. It’s ok if a 20% return on 100k is the best you can do. The financial media have done everyone a disservice. They omit the part of the Big Short where they held losing options for YEARS before getting rich. I can only speak for my own experience, but the biggest difference between the market wizards and everyone else is probably DNA. They have an ability to take risks on large sums of money that the average person could never imagine. That’s a major edge…probably the biggest edge available. Having the wherewithal to endure large account swings is not for most of us which is why the correct answer for the majority of traders is to take profits when faced with massive unrealized gains. Now let’s talk about portfolio performance optimization. This comes into play if the winner is small enough so that it’s not an emotional burden. For example, if a trader put 25 basis points (bps) into a DOTM option that goes on to 20x, that is still only a 5% account appreciation. At this position size the trader can think with his prefrontal cortex instead of his dumb lizard brain (limbic system). Different traders need to optimize for different things. Some people just want to straight up maximize returns. Others need to prioritize consistent performance, especially those who are managing other people’s money or looking to raise funds. Traders and investors who need their account balance to help pay for things outside of the market are also operating in a shorter timeframe and generally would rather have consistency and smoothness of returns rather than higher but much more volatile ones. Traders with true long-term capital and the psychological fortitude to ride out massive profit volatility should hold and press large winning trades because that will compound capital at the highest rate in the long run. The biggest mistake we see with traders who decide to hold their winners is that they are optimizing for the long run even though they aren’t managing true long-term capital. Most people underestimate what it takes to apply a disciplined process day in and day out for a decade. And a decade is the bare minimum we would consider long-term. If you want to see how we ended up managing our 20x winner on AMD you’re in luck because Tyler will be talking about it in our free DOTM webinar this Thursday, October 4th at 9PM EST. Click this link to sign up for the Macro Ops DOTM special event! Tyler will be presenting all the specifics of our DOTM option strategy and how we used it to produce a 2000% gainer on AMD. He’ll also be discussing our year-to-date performance for the DOTM plays, the winners and the losers. You don’t want to miss this. If you have any interest in our DOTM option strategy that has produced 2000% returns, sign up now at the link below!